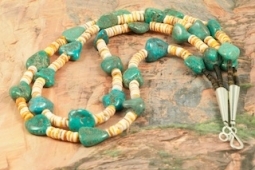 Beautiful 2 strand Necklace featuring Genuine Kingman Turquoise Nuggets and Spiny Oyster Shell Heishi. Finished with Pen Shell Heishi with Sterling Silver Cones and Clasp. Created by Santo Domingo Artist Carol Pacheco. The Santo Domingo Pueblo is in New Mexico, near Santa Fe. Necklace is 20" long x 1/2" wide.